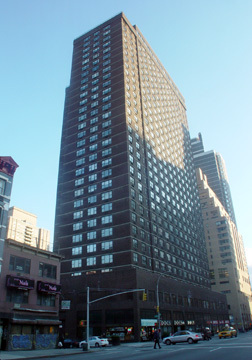 When this 31-story, dark brown-brick rental apartment building was erected in 1978, the stretch of Third Avenue between 86th Street, the "main street" of Yorkville, and 96th Street, was in transition from a low-rise environment with numerous tenements to a lively high-rise enclave. In recent years, the area has matured into one of the more desirable ones in the city because of its convenient public transportation, excellent neighborhood shopping and proximity to many schools. Much of the lively character of Yorkville has gone, however, and been replaced with rather routine high-rises. This was one of the earlier large buildings along this stretch. 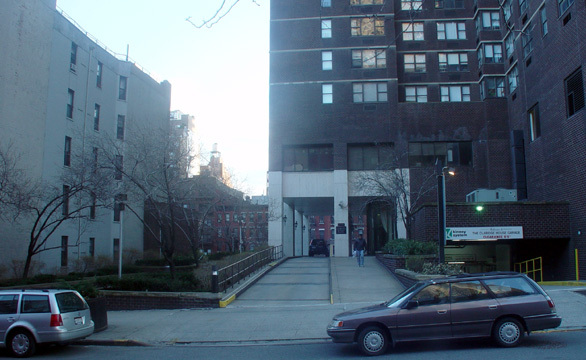 It contains 402 apartments and was developed by the Milstein Organization. It is convenient to public transportation, neighborhood shopping and numerous restaurants in the area. A cineplex is across the avenue and the William Doyle auction house is half a block away to the west on 87th Street. The building has a health club and pool, a sundeck, a concierge, a doorman, video security, valet service, a mid-block driveway, a garage and a bicycle room. It has no balconies or terraces and is not close to parks. The building's tower is setback on a two-story retail base and the building's entrance is at its rear, eastern side under a two-story marble colonnade facing its through-block driveway. The free-standing tower also has a landscaped plaza on the east side of its driveway. Given all its amenities, it is a shame that the tower is so bland and unattractive. The dark brown brick facades, however, are handsome and since it was erected it has been surrounded by more interesting towers and the neighborhood has undergone quite a nice transformation.